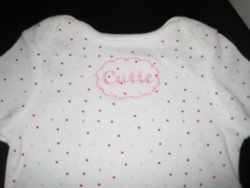 How to embroidery a baby onesie. Cut a piece of Adhesive Sew and Wash stabilizer about 1″ larger than the hoop. Peel off the paper, then wrap Adhesive Sew and Wash stabilizer around the hoop the hoop. Turn the onesie inside out. Place the onesie on top of the stabilizer. Using straight pins or small binder clips hold the fabric e the neck area away from the embroidery. Be careful to keep your fingers away from the needle. After the embroidery is finished. Soak the onesie in warm water to remove the Adhesive Sew and Wash stabilizer. Peel the No Show Fusible up and trim around the embroidery. Fuse a piece of Fuse So Soft on top of the embroidery so that no stitches touch the baby’s skin. This entry was posted in Machine Embroidery FYI, Make for Baby, Project Tutorials, Tips/Techniques FYI on September 3, 2011 by sewvacoutletblog.